Sopka may not be as recognizable as many other European cookstove manufacturers, especially those in Italy, but they are every bit as talented. A small company Founded in Lithuania and now based in Ohio, Sopka has been building cookstoves for nearly two decades and importing them to the United States since 1999. In fact, it was Obadiah’s that first brought their line across the pond and we could not be more proud of the way they have developed over the years. Despite their relatively modest size, Sopka manufactures their stoves with the same advanced robotic welding techniques as their contemporaries in the European market, resulting in highly efficient units that throw a considerable amount of heat while thoroughly cooking anything you care to put in the oven. All Sopka stoves are UL-listed too, ensuring that their build quality is always top-notch. For folks who love the La Nordica line’s look but want a cookstove that can stand up to the challenge of long-term heating, Sopka’s stoves are the ticket. Support from Sopka has been excellent, allowing Obadiah’s to fall in love with these cookstoves and happily recommend them to anyone looking for a durable European cookstove that won’t break the bank while holding up to life off the grid. Some of our customers are in Alaska and they never shut their stoves off! Sopka’s Concept 2 Air series are excellent cookers with an aesthetic that bridges the gap between modern and classic style. It has a clean, minimal front that features glass windows, allowing for a beautiful ambient glow in the room as well as the ability to keep a close eye on your meal (the oven also has a handy built-in thermometer handily built into the glass). Those glass windows are easy to keep clean too, with Sopka’s built-in openings for secondary air flow, which helps prevent soot from building up. Dual controls make the stove a breeze to operate, and a sizeable firebox allows you to keep the heat up for even the largest of cooking jobs. Like many European stoves and even several new Amish models, Sopka is required to note that the Concept 2 Air is not “certified” for heating in the U.S. However, this has nothing to do with the quality of the stove or its ability to heat, and everything to do with recent (controversial) changes in EPA regulations. Rest assured, as an air cooker the Concept 2 Air is designed for space heating in addition to cooking and baking; in fact, Sopka stoves are built from boiler plate steel, by far the strong, most corrosion-resistant material for building a stove. The concept 2 Air Mini takes all of the concepts and style of the original and stacks them vertically in a compact, yet powerful design. Just 38.4 inches tall and taking up less than two feet in width, the Mini is perfect for small kitchens or living spaces where cooking is a must but space is hard to come by. The oven is slightly smaller in width than the original’s, but all of its other dimensions and those of the firebox are exactly the same, meaning that very few of the Concept 2’s abilities are sacrificed for the smaller build of the Mini. The Mini’s footprint is similar to the Baker’s Oven/Bun Baker line, and we find that customers often compare the two. However, outside of their dimensions, the stoves couldn’t be more different and we believe the Mini to be a far better value. 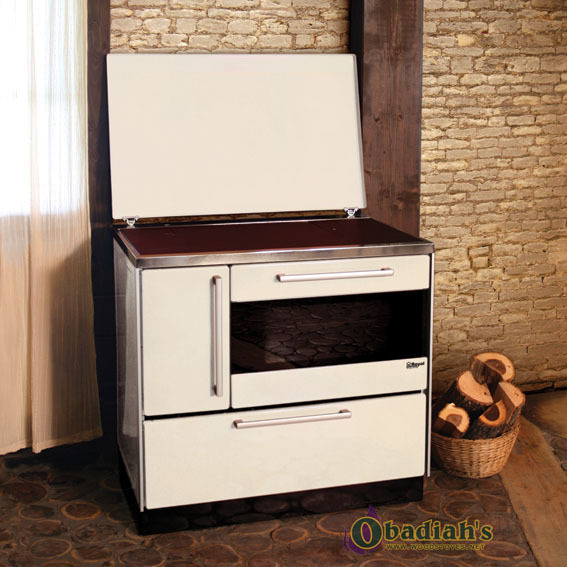 With a 100% Stainless Steel oven above the firebox, it absorbs heat naturally as it rises. The Bun Baker, by comparison, makes use of more complicated physics to route smoke and heat around the firebox- a problem in high elevation or where wind is strong enough to affect the interior of the chimney. 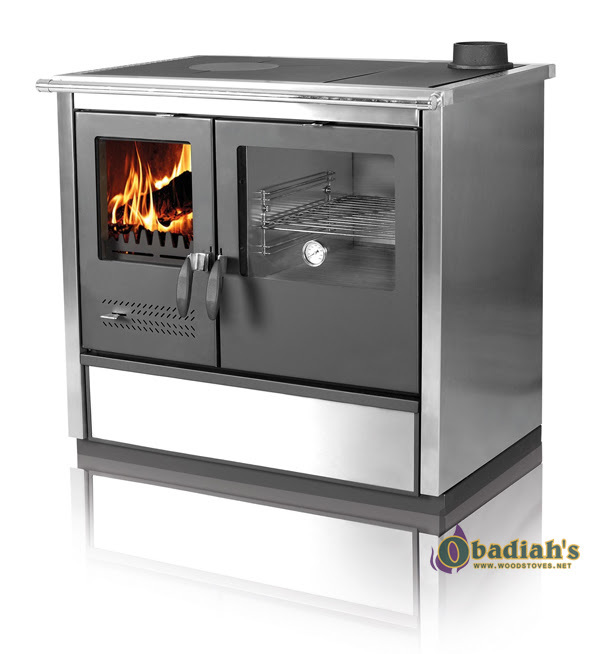 The Mini, however, is designed with efficiency in mind: The refractory lined firebox is able to burn hotter than a steel lined firebox and, with proper maintenance, will last longer with less warpage. 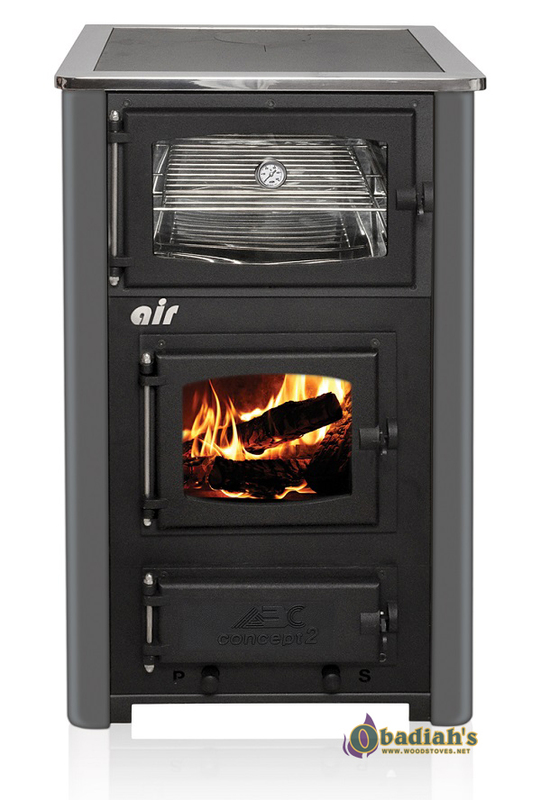 The refractory increases the efficiency of the Concept Air Mini above 85%, which is one of the highest ratings of any wood cookstove sold in 2016. The Concept 2 Air Mini can also be vented from the top or rear, which allows for more room on the cast iron cook top, which lifts completely off so the stove can also be easily cleaned and maintained. Other small footprint stoves like the Bakers Oven/Bun Baker and The Grand Cookstove can be all kinds of difficult to keep clean due to the way creosote forms (ovens that do not have any heat when not in operation tend to condensate when the oven is first initiated as the steel begins to warm up; this causes creosote to form very fast). There is also a large ash pan included with the Sopka Concept 2 Air Mini that is not available with other wood cookstoves of this design and footprint. Weight 418 lbs. 341 lbs. The Sopka North is one of our favorites, with a stainless steel design that will look great even after many years of long winters, as well as advanced refractory in the firebox that allows the stove to burn cleanly and efficiently. The North also demonstrates Sopka’s environmental awareness, with an excellent efficiency rating of 79% and build materials that are entirely recyclable, including vermiculite firebrick (rest assured, especially those of you in the Northwest that may be cautious of that material, that the vermiculite is 100% asbestos-free). 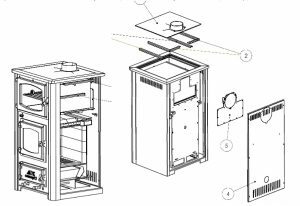 This cookstove also allows for a surprising flexibility in installation locations; with a clearance to combustibles of just six inches, you’ll be able to put the North just about anywhere! Keep in mind that, while the Sopka North does put out 31,500 BTUs, it is intended to be used for cooking and baking. That said, if you’re after an excellent cookstove with a modern design and a hint of European style, we highly recommend the North. The Sopka Magnum Cookstove with soapstone. The Magnum offers a slightly more classic look than Sopka’s other cookstoves, with a design full of traditional embellishments reminiscent of the kind of stove you might have found at Grandma’s as a child. 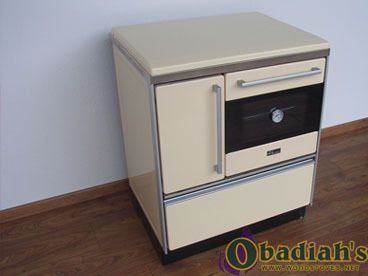 Sopka has included warming drawers made of cast-iron and enamel-covered exterior pieces with the Magnum, a feature not found on their other models and a welcome addition to any cookstove. Most interestingly, the Magnum offers a soapstone option. We’ve seen soapstone included in several North American stoves, but nobody does it like Sopka: With the Magnum, the soapstone is built directly into the sides and underbelly, allowing the stove to retain heat for an impressively extended period of time while making cooking and baking even smoother. This is also by far the best value in any soapstone wood burning stove: At less than $2,700, the Magnum costs thousands less than The Vermont Bun Baker. Most cookstoves have a certain look about them, and regardless of how modern or traditional they are, you generally know you’re looking at a cookstove. Sopka’s “Royal” series is unique in that regard, with an aesthetic that perfectly matches a modern electric range stove. If you have a modern kitchen and would love to get away from electric stoves yet don’t care for the look of most cookstoves on the market, the Royal might be just what you’re after. Obadiah’s feels that Sopka’s Royal Cookstove is currently the best value wood burning cookstove in North America at less than $1300 as of 2016. 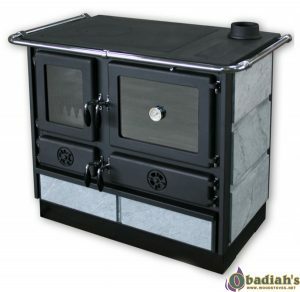 The next best is Baker’s Choice at just under $1600, but that stove has a flat-black painted body that is difficult to keep clean. The Royal is made from Porcelain, which is easy to keep looking nice for years. Underneath the Royal’s deceptive exterior is a wood-fired cookstove. 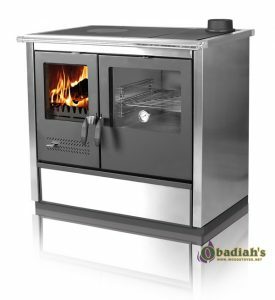 Behind the solid front panel hides a sizeable firebox with an easily accessible ash box that makes cleaning the stove a breeze, and the sizeable glass door allows you to look in on the economical firebox. Both the 720 and 900 models offer the same dimension of firebox, with the main difference being the overall width of the unit and the width of the oven (the 900 offers a larger oven). The firebox is a bit on the small side for heating an average home, but it’s perfect for a small cabin or house: The Royal 720 produces 27,300 BTUs (enough to heat about 500-800 square feet) and the Royal 900 produces 33,250 BTUs (which will heat a little over 1000 square feet of insulated space at 30 degrees). The Royal will feel familiar for anyone used to modern gas or electric ranges found in most kitchens. If you’re looking for a long-lasting cookstove with a contemporary design without breaking the bank, The Royal is your best bet. Weight 293 lbs. 54 lbs. 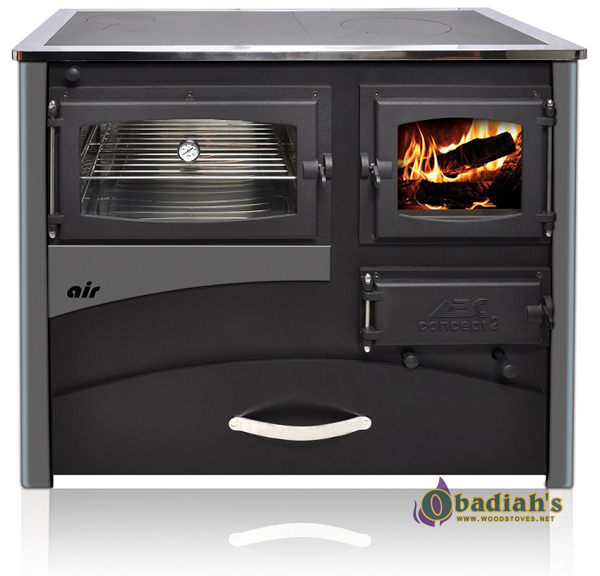 Sopka cookstoves and more can be found at Obadiah’s Woodstoves and Alternative Energy!